Our preschool program makes learning fun for children who are preparing to enter a formal education system. The program focuses on social interaction, basic reading skills and learning through play. The program prepares young children for that all important leap into kindergarten. Children are active by nature. At Cardinal Leger Child Care Centre the children are learning to respect each other and their environment. Social interactions are key at this stage of development. Facilitating children’s interactions with others is a large part of the day to day curriculum. Preschool children are learning to take risk and enjoy learning. Early literacy appreciation is encouraged. Children learn through hands-on activities that incorporate play. 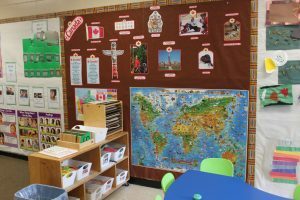 The room is set up into learning centres such as Dramatic Play, Blocks, Science, Math, Reading and Art just to name a few. For older preschool children, letters and numbers are introduced. Children will move on to Kindergarten with a healthy self-concept and the enthusiasm for learning that will take them through a lifetime of experience and achievement.